Jouni Havukainen is one of those genius artists who became a long-time pioneer reinventing the early essence of industrial and dark-ambient music. In Slaughter Natives also is a long-time reference in a genre, which remains dominated by the creativity of this sound architect. In Slaughter Natives became less prolific when it comes to compose new work, but this particular concept reveals 7 new cuts. Nihil is a French visual artist who’s already been active for years and years now. He seems like obsessed by the darkest thoughts in life, which made him set up the “Ventre”-project. It ‘started in 2004 as a series of short texts and soon developed to include imagery as well, exploring transcendence and identity matters. After more than ten years of work, the Ventre art book collects ten cryptic and philosophical texts and seventy-five portraits of saints and martyrs, including a retrospective of past works and a number of previously unreleased ones. This release features the dark visual themes of Nihil and a soundtrack composed by In Slaughter Natives. 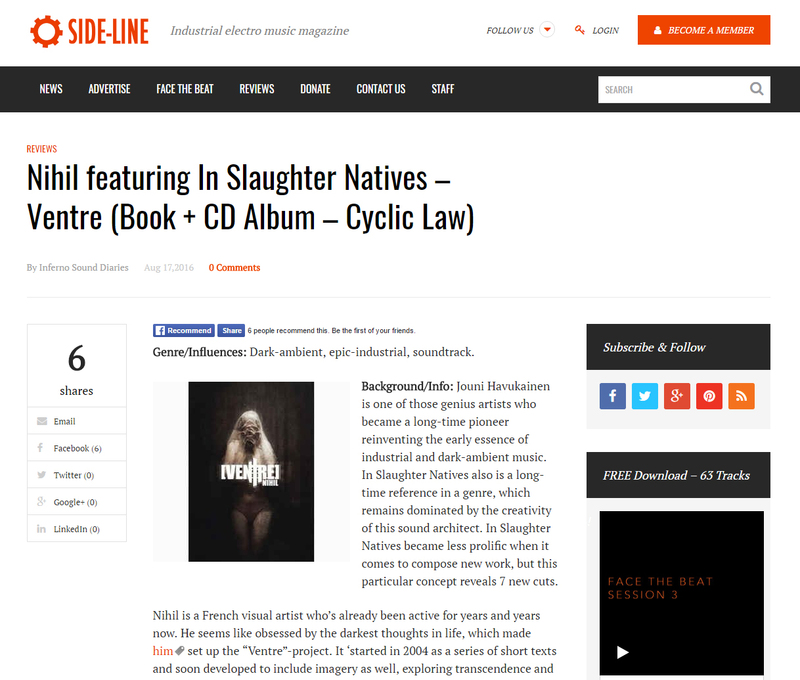 In Slaughter Natives remains inspired and driven by this unique sound bombast revealing overwhelming dark sound structures and heavy epic arrangements. From start on we enter this enigmatic sound universe terrorizing the visitors by heavy, blasting sounds and brain-damaging drones. The soundtrack has been accentuated by crashing sound manipulations and industrial percussion passages. The epic arrangements still have this unique and magical sensation delivering stupor and fear. Some parts of the work clearly sound like pure soundtrack-wise and could be perfectly adapted to a real film… or simply the macabre, but beautiful universe of Nihil. The enigmatic work appears to be a perfect stimulation to compose intriguing sound passages empowered by mystic sound atmospheres. + + + : Nihil and Jouni Havukainen seem to know each other for quite a long time and that’s maybe why this work appears to be that harmonious. It’s maybe not that difficult to associate dark visual work together with dark-ambient music, but you can feel a kind of complicity. The composition of In Slaughter Natives features all the familiar, impressive elements of this master of darkness. “113th Scar”, “Fragment 004” and “One Last Farewell” feature the enigmatic power of the In Slaughter Natives sound. – – – : The main point that hurts with such a concept is that both artists are indissociable. Their respective work is only a part of a higher creation, which can reach its apotheosis by a special live event where images and sounds come together for the pleasure of a selected audience. Conclusion: Jouni Havukainen became a rather discrete artist when it comes to compose new music, but he hasn’t lost his original taste to compose poignant ambient sounds. Best songs: “Fragment 004”, “One Last Farewell”, “113th Scar”, “Isolation”.